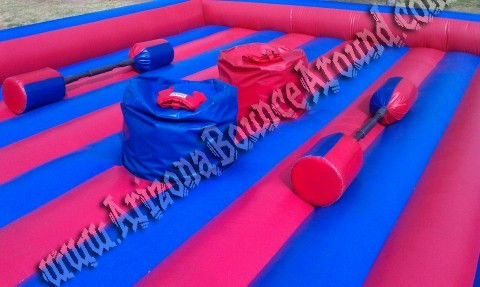 Inflatable gladiator Joust is a very popular rental for any party or special event. Our Inflatable Joust arena is great for all ages from 5 to adult but just make sure the 2 players using the inflatable Joust are similar in size. This jousting Inflatable comes complete with 2 Jousting poles and headgear for both players. 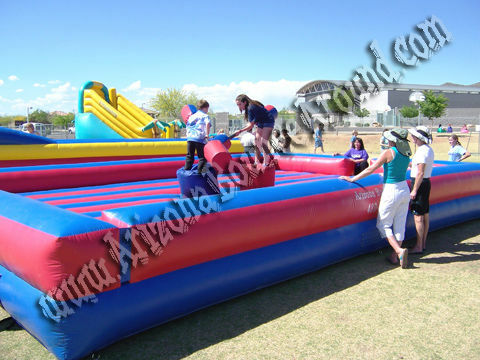 Our Inflatable Joust arena features Styrofoam pedestals that wont sink in when you stand on them. Most Jousting games feature foam joust pedestals that are very hard to stand on. If you're planning to rent a Joust inflatable for your next party, look no further than Gravity Play Events for all your inflatbale party rental games and activities. We also rent big boxing rings for all your high energy parties. Our Gladiator Jousting arena is much bigger than most other joust rentals in Denver, Colorado Springs, Aurora or Fort Collins. Check out these Knight Fight Suits for that perfect Gladiator Joust event. 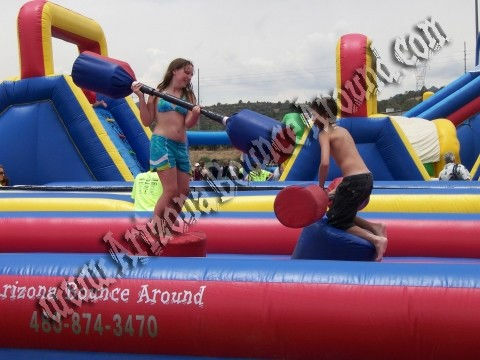 This gladiator joust inflatable rental price includes standard set up. Standard setup is considered a real grass area that we can stake into the ground or indoors. Within 80 feet of sufficient electrical supply. Delivery and removal within included delivery area with no restrictions for delivery, set up or pickup. We do not install this jousting inflatable on dirt or sand but it can be setup on asphalt, concrete or artificial grass by adding sand bags to your order.